Here, indeed, we have a woman wrapped in silence, clearly pondering many things in her spacious heart. Mary is caught up in contemplation and stillness, and invites us to do likewise. But, as I said in my feast day post last year, there is strength and passion in her serenity; a strength which comes from her rootedness in God. Mary is no wispy, wimpy girl lost in a daydream, but a young woman whose heart is so spacious it can contain the very fullness of God. 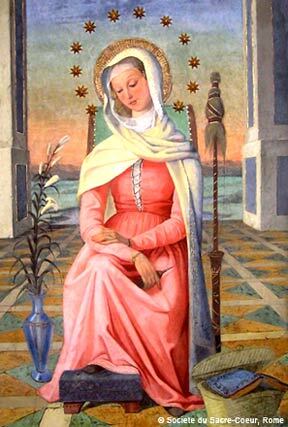 Let us pray to Mary, woman in whom love became flesh and who knew how to love the adventure of God with all its consequences, that she may be for us the strength, the encouragement and the light in this new stage of your life. A powerful prayer-picture. Thank you for sharing it with the rest of us, Silvana. Dare I ask for prayers that we might ALL have the grace of being "spacious-hearted, strong and contemplative"? Those words touched my heart!